At Winning Smiles, we regularly provide whole mouth dental implants to replace all the teeth, as well as for single missing teeth, or a few missing teeth. Here we outline the best methods, the costs involved and information designed to help people choose between the different types of Full Mouth Implants available. 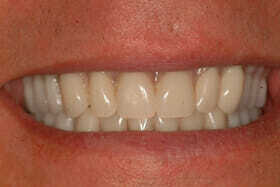 For more cosmetic needs we also provide Full Sets of Veneers. People visit us from across the UK. We are regularly amazed at the life-changing effects of replacement teeth, transforming people’s lives is a privilege and a pleasure for us. In most cases, the new smile is better than the original teeth. We do everything we can to both deliver high-quality components and high levels of care and to be affordable. We offer innovative dental implant techniques, practised over hundreds of cases, to enable full mouth implant teeth, fitted in a single visit. We use the best possible quality implant materials, from a German manufacturer, Ankylos, which bond well with the jaw and last a long time to offer the best value. The whole jaw Dental Implants are all connected to a titanium frame which is immune to decay and ultra reliable. The phrase ‘whole mouth’ implants will be a choice between a single jaw, or both, entirely up to the patient circumstances. Using the very latest WeldOne implant techniques we build a customised and personalised frame for your jaw, which achieves the ultimate strength required to enable the same day fitting of the final teeth. Connecting the ‘screw in teeth’ to this frame provides an incredibly secure base on which we can fit either porcelain or acrylic teeth to replace the ones you have lost. This unique stability means that patients leave the clinic with their final full set of replacement teeth just hours after they arrive, no temporary solutions are needed. 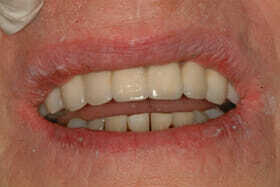 We delight in meeting those who believe they are not suitable for dental implants. We can treat almost any case, and people come to us from all over the country for their brand new smile. As well as treating people who know what they need, many are not sure. If you are worried you may be about to lose all or some of your teeth; please talk to us, as we can help. Acting sooner can often slow deterioration, and in some cases save lots of time. Things are likely not as bad as you think, and we are always happy to guide you through the range of solutions, as quickly or slowly as you need to go. The method used, and whether the treatment can be done in a single visit (as we do here), less clinical time is less expensive for the patient. The manufacture of the dental implant materials, which vary significantly in cost (to us). The time is taken to carry out the treatment (experience of the dentist and efficiency). If there are fewer repeat visits, it means lower clinical costs. The overheads of the practice are a factor; expensive rents will elevate the underlying costs of dental clinics. Winning Smiles operates an advanced, digital, dental implant clinic conveniently located slightly out of town between Brentwood and Romford, near the M25 in Essex. Providing a full set of replacement teeth means that you will need a CT Scan. This is to make sure that the full arch treatment is suitable. It is useful to know that until a CT scan is taken, then nobody can tell you what your options are. Anything is possible, usually. So as part of the initial consultation, for free, so that you don’t have to make repeated trips to the clinic, we take a CT scan there and then. It means we can all know straight away. Many of our patients come a long way, and this is the most convenient way to do things. Below is as much information as we can muster with some photos and costs. Using implants to secure a denture is the most cost effective way of replacing all the teeth in one jaw. 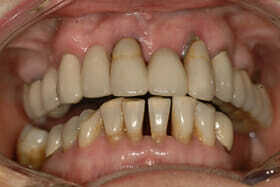 Implant-dentures rest on the gum but have 4 or more implants to hold them in place. This method addresses one of the significant problems that patients talk about with older style dentures – the fact that they will never sit still! Implant dentures stay firmly fixed in place and allow you to eat hard foods again and talk with the confidence that they won’t fall out mid-sentence! 3D digital imaging enables us to create custom titanium frameworks with a full set of acrylic upper or lower teeth fixed permanently to them. The whole mouth set screwed into place onto your implants. • This is a very cost-effective option because the additional strength provided by the titanium bar means that fewer implants are required than for a full set of porcelain teeth. • A full set of porcelain teeth will take more than a week to replace or repair in the event of an accidental breakage: we fix the acrylic teeth on the same day. In this treatment option, Winning Smiles use Harley Street technicians to create a top of the range, bespoke set of porcelain teeth for you. 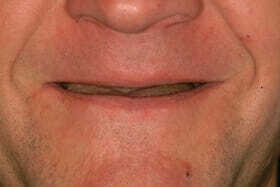 In our view, cheap porcelain bridge teeth are not worth considering. They actually look far less attractive than well made acrylic teeth, so if money is an issue, acrylic teeth (which can look stunning nowadays) are well worth considering. Custom-made porcelain teeth rest on 6-8 implants, which provides each jaw with enough strength to support a full set of 12-14 teeth. The most surprising thing about Dental Implants is that there is very little pain. It looks like it should hurt, but the reality is that most dental pain is caused by touching a nerve on a live tooth. In this instance, we’re removing teeth entirely, so while there is some discomfort, we are practice pain management at Winning Smiles, we take the time and give all our consideration to the comfort of the patient, and never rush. While the operation is being carried out your jaw is numbed so that you don’t feel any pain. It is entirely natural to be nervous, and you can choose sedation if you wish. In our experience, if you have one or two implants inserted, you will be able to go back to work or to resume normal activities on the same day. If you have multiple implants or a full jaw treatment, you will need a couple of days’ recovery time as you would with any other operation. Acrylic dentures have made this option more affordable, and at the same time they now last longer, are less likely to sustain damage and are more easily repaired. The reason acrylic teeth are less expensive than porcelain, is something to do with material but more importantly acrylic is more straightforward to manufacture, it requires less manual input and is more forgiving of damage. In other words, it is that porcelain has so much manual labour input that makes them expensive, it is a difficult material to repair, and replacement is the more likely result of damage. However, porcelain does retain an incredible lustre for long periods of time, so as always, it is a balance between appearance and function. After an initial free consultation to find out whether dental implants are the right treatment for you, we carry out an immediate detailed assessment and x-rays using our specialist low-dose dental CT scanner. We will provide a written assessment and include all the costs, so there are no surprises. Winning Smiles have been doing private adult cosmetic dentistry for 15 years. We have fitted around 1,000 dental implants, and have the latest technology to make our service accurate, comfortable and considerate. We place the health of your teeth at the heart of every decision we make and we always explain and talk through all your options with you. We practice pain-free dentistry.